Hi everyone! 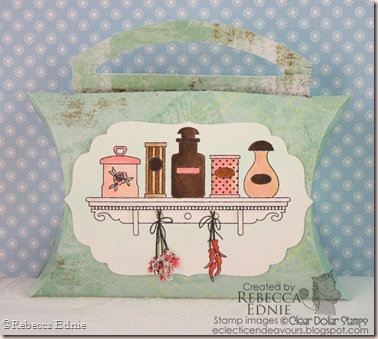 I am so excited to be part of the Clear Dollar Stamps Sneak Preview for June. Today, I am previewing a great kitchen set called Vintage Spices. This is my first project for this set. This is a pillow box, perfect for a gift card or other small gift. A packet of spices would be perfect in here! The flowers hanging from the shelf are covered in Flower Soft. The background paper is gently airbrushed with my Copic Marker Air Brush system keeping my shelf nice and white. The pillow box template is a Timeless Template from PaperTrey Ink. I used glittered and embossed paper. I actually don’t recommend it because it is really hard to score the curves without a ruler or template. This set will be available June 1st. The link on Lori’s blog, Clearly iStamp will be active then. Be sure to visit the rest of the DT who are previewing this set today. Very nice Rebecca! Hope you are having fun 🙂 I love that flower soft and how you hung your herbs from the shelf. Soft and pretty, the flower soft is a great idea.